Good morning! Today I'm helping to kick off the first day of a two day blog hop to celebrate the Pretty Pink Posh November Release! This us a wonderful holiday and winter themed release - so many fun stamp sets, fabulous new dies, and the first PPP Jewel Mixes! You can check out the entire release HERE. There is TONS of inspiration to be found along the blog hop - and a few fabulous giveaways as well! I have a fun card to share today featuring lots of the new dies - and not any stamp sets at all! I love finding inspiration on Pinterest, and I had come across this photo recently, and thought of the fabulous new Layered Tree Dies and Pine Sprig Dies - and knew I needed to create a card from that inspiration! I had created several alcohol ink backgrounds a couple days before, and was just deciding how and what to use them on, so I pulled one of them for this card. I used one color of alcohol ink and some rubbing alcohol to create my background - I love the variation of color that it created! I die cut the Layered Tree Die and several of the branches from Pine Sprigs Dies from white cardstock, and did some blending with Distress inks to get them to a color I wanted. I also die cut a Scalloped Frame. I began by adhering that around my background, then added the pine sprigs at the top, trimming off the extras overlapping the card. I layered together the tree, adhering it together from the back with tape, then attaching with foam adhesive over my background. Next, I added a nice heavy dose of white paint splatters to add a "snowy" feel to the card - allowing it to go over the background and all my adhered die cuts so far. Then, I die cut the new Season's Greetings Script Die, as well as the star for on top of the tree, using silver glitter cardstock. I also die cut a couple extra Season's Greetings Script from white cardstock, layering them together for a bit more dimension. Final finishing touch was a few sparkly Snowflake Sequins to complete the look! I have these two other cards that I created with the new release - click on either picture for more details if you want to see more! Now the fun part - there are a total of 4 $25 Gift Certificates up for grabs - 2 winners for each day - Winners will be picked randomly along the blog hop. Make sure and leave comments by 11:59 PM PST on November 20, 2018 to qualify! Winners will be announced after that on the Pretty Pink Posh Blog! These are sooo fabulous Heather! LOVE that pink tree! Love the color combo with the pink tree and background. Thanks for the inspiration. All of your cards are pretty but the tree card is amazing. Love it! Gorgeous cards! I love all the pretty layers and soft colors on your tree card. Nothing brings me back to my childhood more than a pink tree, Heather … thank you! Yours is so very lovely! Both cards are beautiful. The Christmas tree card is just amazing. 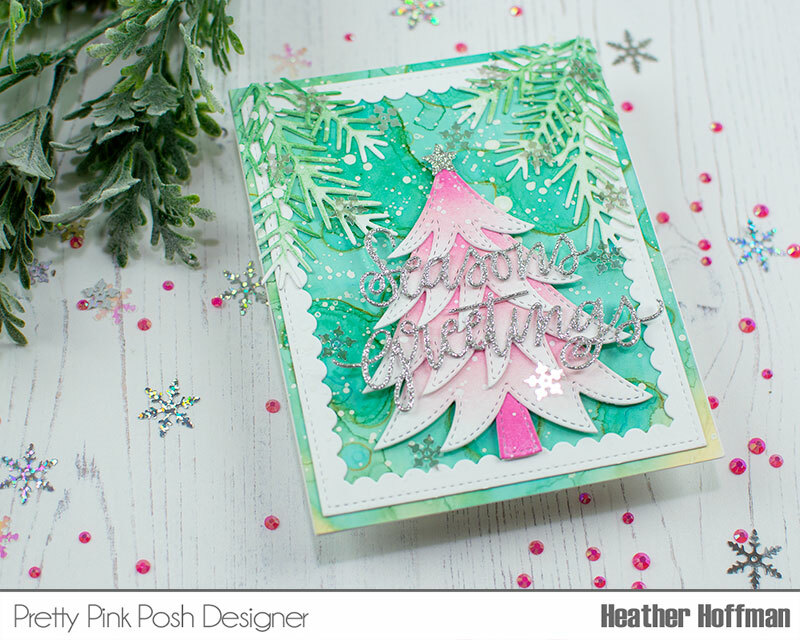 Love the beautiful pink tree, Heather! That card is swoon worthy!!! 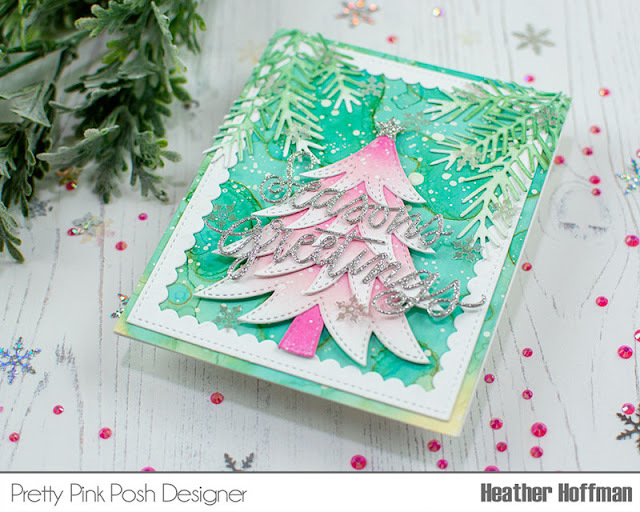 The layered tree die is on my wish list!! So pretty in pink and green with the sparkly greeting. Awesome cards, especially like the pink and green tree card, and the inspiration photo. Whoa your tree card is gorgeous, love the non-traditional color scheme! LOVE the pink tree!! Fabulous rendition of the picture!! All of your cards are lovely. Those critters are so adorable. Oh my gosh! Ok that first card is my absolute favorite Christmas card ever! It is done in my two most favorite colors ever! Pink and Green! Now I am really wanting that tree die big time! This is really beautiful. LOVE your color choices! Beautiful! Love your pink tree! pretty card - love the non traditional tree - awesome!!! These are all beautiful cards! That Christmas tree die is amazing. LOVE your pink tree, Heather!! Love your cards, especially those caroling critters! Love your beautiful pink tree. What a beautiful card. Oh my!!! Your cards are so beautiful!!! Stunning colouring for this unconventional Xmas tree!!! Love it!!! Super pretty tree and beautiful card. That pink tree is everything! Oh my goodness. I love your pink tree! I love the pretty pinks and greens in your tree! This is really beautiful! Love the pink tree against the green. Oh my! That awesome tree card literally made me say "Oooohh" out loud when I saw it; it is absolutely stunning! Pretty pink Tree. So nice! I love all of your cards. The tree is so beautiful. It reminds me of our tinsel tree we had when I was growing up and we had this circular color lamp that would show 4 colors on the tree. After a few years, the red faded and it started to look pink! The tree would turn blue, green, yellow then pink!! Wow!! Stunning masterpieces!! Both of your cards are amazing! Your color choice on the tree is astounding! The sweet carolers with the picket fence is perfection!! You are so talented and creative! Am loving your adorable Christmas cards! Love the pink tree, my mother had a pink tree I just hated. your cards are wonderful and thanks for sharing your work with us. Such a pretty image you took your inspiration from, and made your own lovely card using the tree and springs dies. Oh what festive cards! I LOVE the pink tree, it is so striking on the teal background. 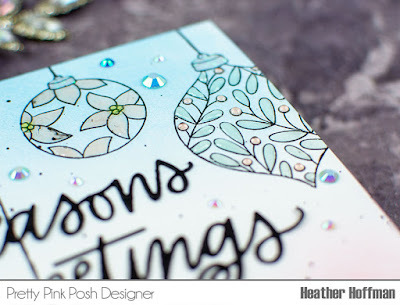 Fabulous cards, Heather! That's a beautiful image that inspired your first card. 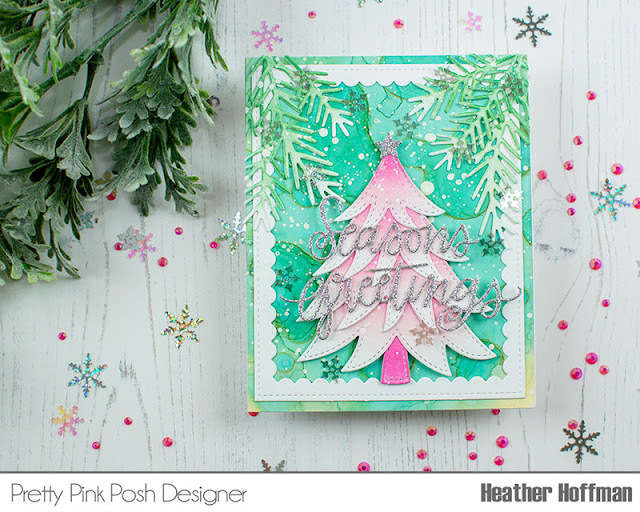 I love how you recreated the pink tree with the layered tree die and some ink blending. The additional pine sprigs and the alcohol ink background make this card really special. Thanks for sharing! All 3 cards are very detailed and cute. The teal background really sets off the pink tree. Thanks for sharing. Darling card with that cute tree! Love the color combo! 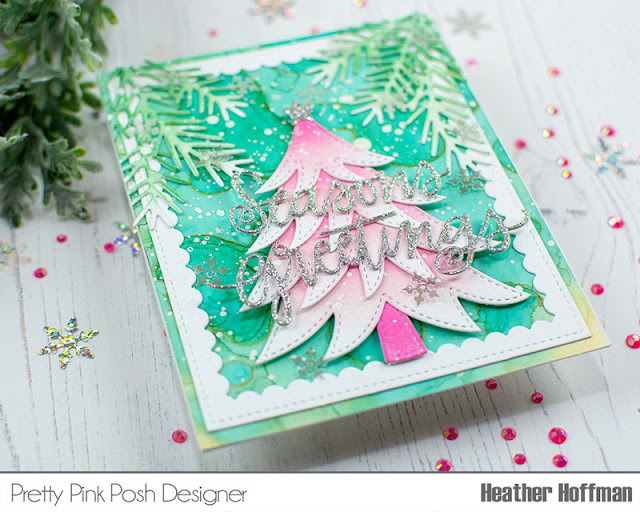 Pretty pink Christmas tree, love the color combos on these beautiful cards! Awesome coloring too. What fabulous cards. I like seeing your inspiration image to go with your card; it helps me see how to get inspiration from all these cardmakers I follow without making exact copies. I don't know if that makes sense, but please know it's super helpful to me! Thanks for sharing your creativity with us. Really so, so beautiful. The Pink Christmas trees is amazing! Wonderful cards. I love those caroling critters! 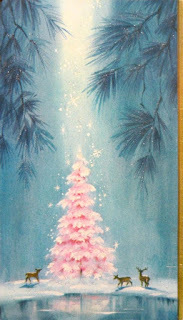 Love your cards, but especially the Pink tree! Wonderful cards, Heather! The tree card is especially fabulous! Love the non-traditional colors - The pink tree is absolutely stunning! This is a great release from Pretty Pink Posh. Your cards are a great example of fun ways to use these new products. Thanks for sharing them. Great cards Heather. I love the pink tree! thinking outside the box is always a good idea. nice translation of that picture without copying. that's how it's done! and the other two cards are also adorable. i like Christmas cozy. A pink Christmas tree . . . so pretty!! Your cards are lovely! How fun is the pink tree! Fabulous! I love the Christmas tree!! 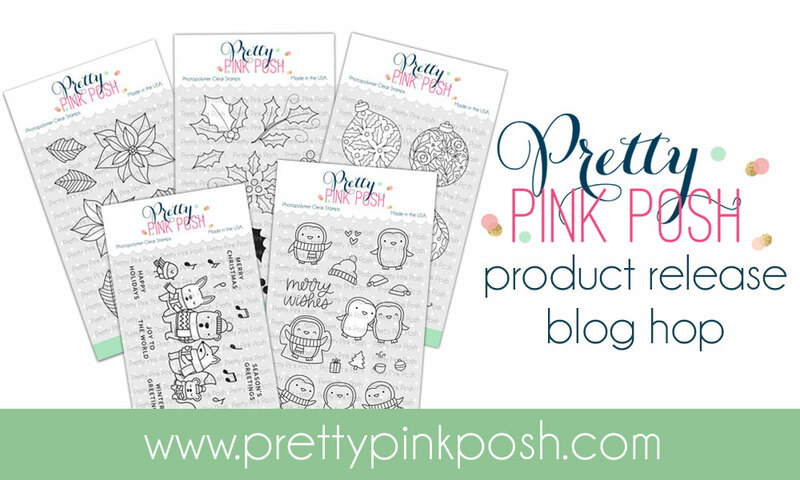 Pretty Pink Posh is one of my favorite stamp companies. You did an outstanding job making the perfect Christmas tree card! !